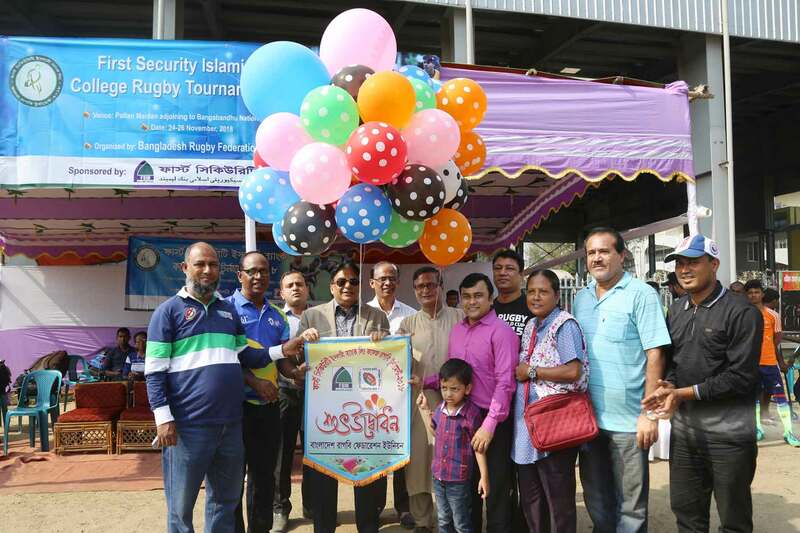 The inauguration ceremony of the 9th First Security Islami Bank College Rugby Tournament-2018 sponsored by First Security Islami Bank held on November 22, 2018 at Paltan Playground, Dhaka. Mr. Abdul Aziz, Additional Managing Director of First Security Islami Bank inaugurated the Tournament as chief guest. Mr. Dewan Nazrul Hossain, National award winner Gymnastic player was present as Star Guest of the program. Among others Mr. Moisum Ali, General Secretary of Bangladesh Rugby Federation, Mr. Sayeed Ahmed, Joint General Secretary, Mojibur Rahman, Secretary of the 9th First Security Islami Bank College Rugby Tournament-2018’ and other officials along with teachers of different colleges were present on the program. Team from 10 Colleges are participating in this tournament.